There’s nothing quite like a pan of warm cinnamon rolls fresh from the oven. Unfortunately for those who are sensitive to gluten, a flaky cinnamon roll made from regular flour can wreak havoc on the digestion. 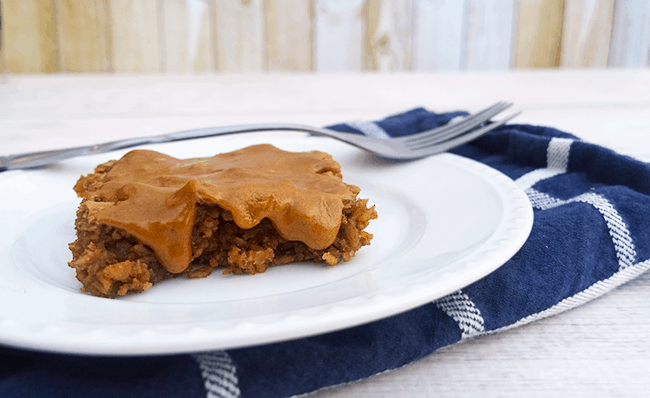 This cinnamon roll baked oatmeal is a delicious gluten-free alternative. Every Sunday morning when I was little, we had sweet rolls of some kind for breakfast before heading off to church. That gooey goodness slathered in orange flavored frosting was heaven on a plate. My mom didn’t want to mess with making cinnamon rolls from scratch, so I never knew anything but the kind that came from a tube. Not only is it incredibly time consuming waiting for the dough to rise and craft them from scratch, but regular cinnamon rolls don’t agree with my digestion. Gluten-free breakfasts like bacon and eggs and oatmeal are quick to make, but they can get boring fast. To solve all my problems, I decided to come up with a gluten-free baked oatmeal recipe that tastes just like cinnamon rolls. These are moist, sweet and utterly delicious! I normally don’t frost things, especially my breakfast, but I couldn’t make a cinnamon roll baked oatmeal without an icing. I used coconut sugar for these since it’s healthier than refined sugar. I used to think that the evaporated cane juice listed on “healthy” dessert labels meant that the item was free of refined sugar. It wasn’t’. Evaporated cane juice, even if it is organic, is just a fancy pants name for refined sugar. I like the coconut sugar even better though. Not only is it unrefined, but it has a rich, almost caramel flavor to it. I use it in these chocolate dipped almond biscotti as well. I made my version with good ol’ butter, however feel free to substitute coconut oil if you don’t do dairy. I did however use cashew milk in the caramel vanilla icing. You can even use homemade alternative milks. This recipe for coconut milk only takes 3 minutes to make! 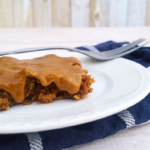 These gluten free baked oatmeal bars taste like cinnamon rolls without all the work. In a large bowl combine all of the baked oatmeal ingredients, except for the oats and whisk until thoroughly combined. Stir in the oats and then pour the mixture into a greased 8x8 baking dish. Bake at 350 for about 25 minutes, or just until firm in the middle. Process the coconut sugar ½ cup at a time in a coffee grinder until powdered. In a bowl combine the powdered coconut sugar, butter and vanilla and mix thoroughly. I use the whisk attachment on my mixer. Add milk a small drizzle at a time until the icing is the desired consistency. 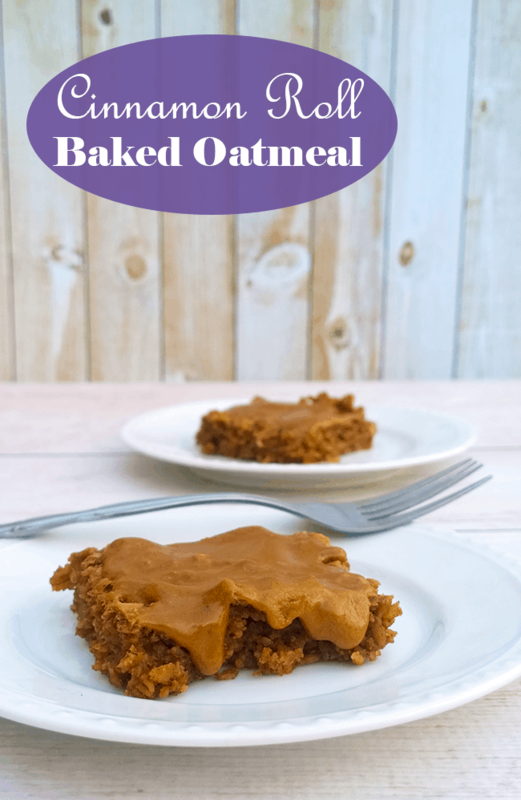 Allow the baked oatmeal to cool a little before spreading the icing on top.